I recently stumbled upon a photo of what has to be one of the more intriguing bathrooms that I have seen. 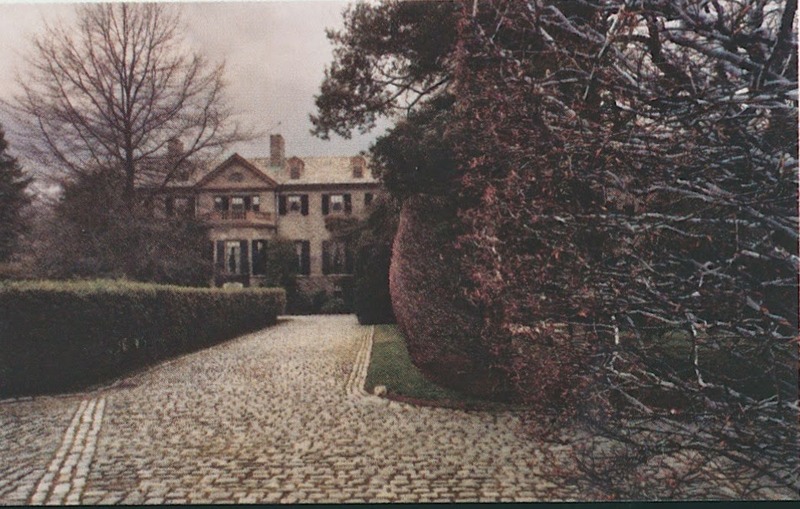 The bathroom, which you can see above, belonged to Joan Whitney Payson and was located at her house at Greentree, the Whitney family's Manhasset, Long Island estate. 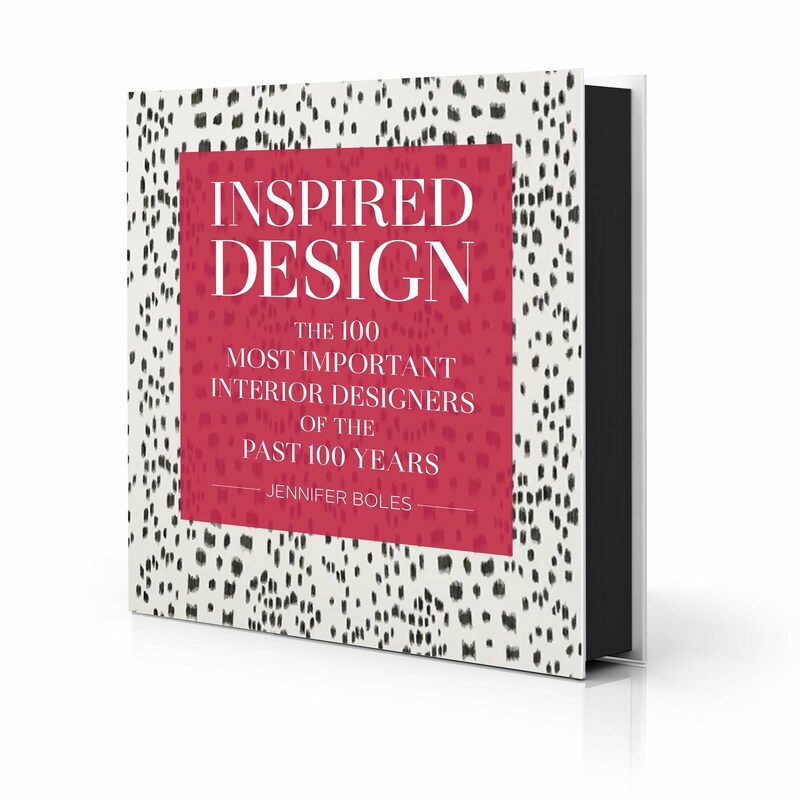 Payson was the daughter of Payne Whitney, who at one time was one of America's richest men. 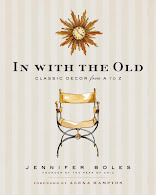 (It was Whitney who, beginning in 1904, bought the six hundred acres that became Greentree.) Upon her 1924 marriage to Charles Shipman Payson, Joan and her new husband moved into a small cottage on the property, which was given to her by her father, but after a few years, the couple decided to build a new house at Greentree. Desiring a large but comfortable house, the couple turned to society architect William Adams Delano, who conceived a charming-looking fieldstone Georgian house. 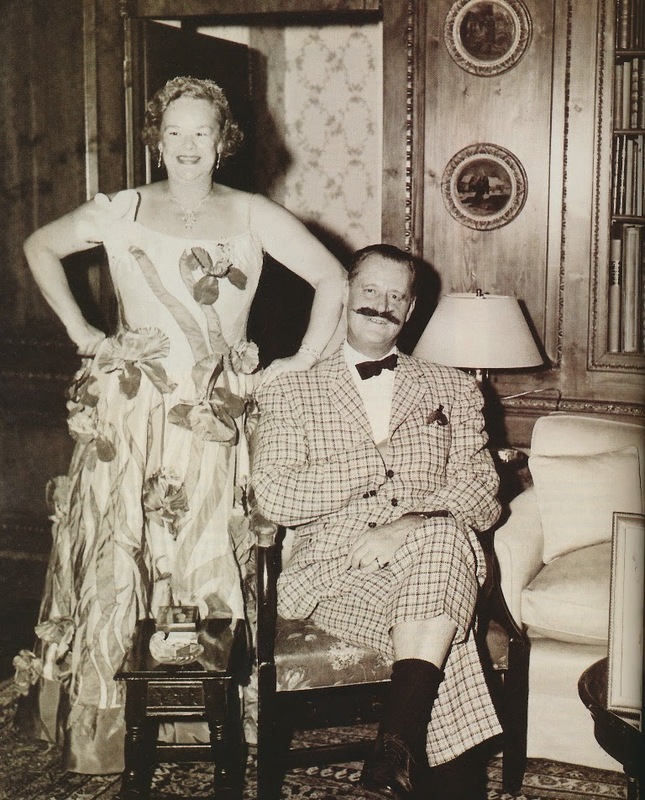 Although the couple owned a number of other houses in various locations, it was at the Greentree house where the couple famously hosted their annual July 4th costume party, which was also a celebration of their wedding anniversary. 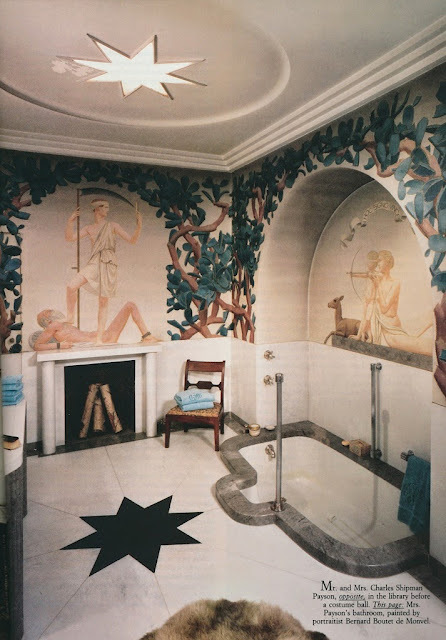 Of the few interior photos I've seen, my favorite room has to be Mrs. Payson's very glamorous and slightly theatrical-looking bathroom. The sunken marble tub and the star-motif on both the floor and ceiling exude a dash of 1920s-era daring. 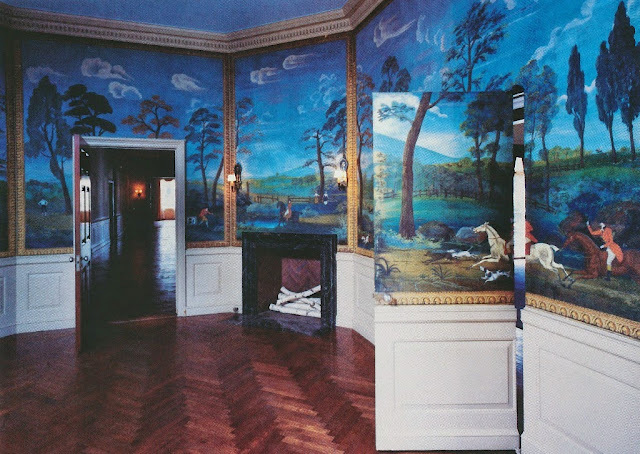 But the star of the room has to be the room's Bernard Boutet de Monvel-painted mural, a mashup of tropical foliage and figural scenes. Joan Whitney Payson died in 1975, and her heirs eventually sold the house and its property to the Unitarian Universalist Church, which has renamed the Payson's house "Veatch House" after a church donor. Based on what I have found on the internet, it seems that the church has retained the family dining room's mural (see photo below), but I have not been able to determine if they have preserved Mrs. Payson's bathroom. Does anybody know? 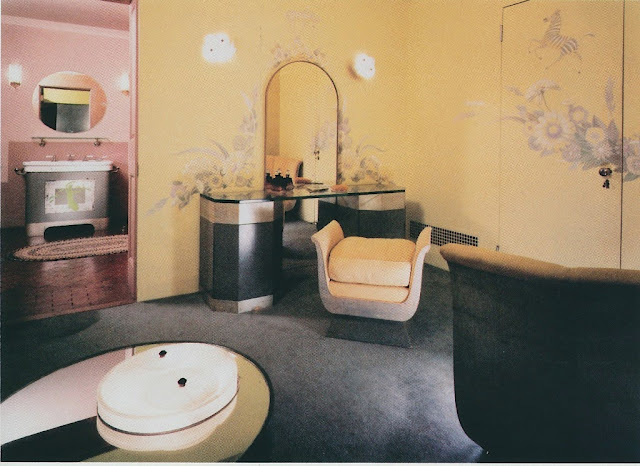 Almost as snazzy as Mrs. Payson's bathroom was the powder room, which was designed in the early 1930s by Charles Baskerville. The family dining room, which was a little less glamorous though no less dazzling than the powder room. A hunting-scene mural adorned the room's walls. A photo of Joan Whitney Payson (whose brother, by the way, was Jock Whitney) and her husband, Charles Payson. The couple was attired for one of their costume balls. Photos from House & Garden, June 1985, interior photos by Len Jenschel. Jennifer, all of the stunning murals are gorgeous and I certainly hope are intact as well as that fabulous starred bath!! Perhaps one of the readers has some updates. Oh how fabulous!! I love it all! They look like they had a ball!!! Such gorgeous looks here! I especially love the look of that "powder room" - though I guess that'd be a bit much in modern day for most people, lol! These wall murals are gorgeous! I especially love the hidden door! The bathroom is still there. I was in it last Saturday, June 3 2017, during a function at the UUCSR, which now owns the property. I swam in the pool and used the pool house on the Sound. Throws Neck Bridge in the background. Breathtaking.